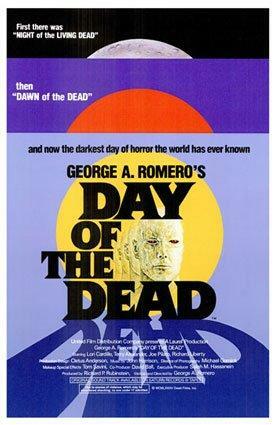 Day of the Dead represented a bit of a departure for Romero when it comes to his famed zombie movies. Night of the Living Dead included a message of political upheaval during tumultuous times in the United States. Dawn of the Dead was a satirical look at American consumerism. Day of the Dead is primarily a horror movie through and through. It may contain themes of a military mindset and the importance of scientific research, but these are secondary to the story. The story in question deals with a group of scientists and soldiers in an underground research facility. It is assumed that the zombie epidemic has been going on for years and that the living dead now outnumber the living considerably. The scientists are desperately searching for a way to stop the phenomenon, and the soldiers are there to assist them in their research. Of course that all looks good on paper, but again human nature comes into play. The confinement leads to a bit of cabin fever as the soldiers grow wary of risking their lives to harvest zombie specimens for the scientists, and the lead scientist seems more interested in his experiments dealing with domesticating the zombies than in stopping them altogether. Romero's movies have always fallen into the "splatter" category, with buckets of blood and entrails a-plenty for the audience to gurgle over. As movie technology moved toward the twenty-first century, however, it became easier to "gross out" filmgoers. We are treated to scenes of people being literally ripped limb from limb, flesh being torn from victim's bodies in the teeth of ravenous zombies, and more blood than it would take to fill the fuel tank of a Hummer. Horror fans ate it up. Despite the gratuitous violence, Day is still a pretty good horror movie. The humor of Dawn is toned down but still present in the character of Bub, a "smart" zombie, and the lead scientist's (who is affectionately referred to as "Dr. Frankenstein" by the soldiers) star pupil in his attempts to domesticate. Bub attempts, on command, to brush his hair, read a book (Stephen King's Salem's Lot), and fire a handgun. This last he does during the film's climax to the delight of the audience. It was assumed for many years that Day of the Dead would be Romero's final zombie movie. It made for a nice trilogy, and it seemed that Romero had said all he wanted to say about human nature through the use of flesh-eating corpses. We now know that this didn't happen. In 2005, Romero released Land of the Dead and used the groundwork laid by Day to further his idea of the zombies' increased intelligence. By the time Day was released, Night and Dawn had already established Romero as the zombie movie master. Countless other zombie flicks had come and gone - some good and some bad - but all at least inspired by, or outright, imitating Romero's earlier films. There is no real innovation in Day in terms of special effects or storyline, but it doesn't really matter. Instead of blazing new territory as he'd done in Night and Dawn, Romero just made a good horror movie. By this point in his career, that was enough for his audience.